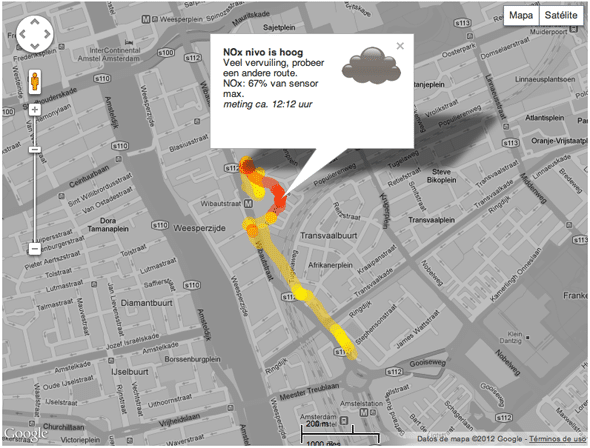 In this post I’m introducing two participatory sensing projects designed for measuring air quality levels and developed from different motivations and contexts. In the previous post I presented an overview about the relationship between citizens and data. Data means nothing without interpretations. As Amber Frid-Jimenez explained in this conference at Visualizar 11 at Medialab-Prado Madrid, we make sense of data extracting information from it, and building knowledge and wisdom from that information. Therefore, it is fundamental to ensure that data is collected with enough rigour to construct reliable knowledge. 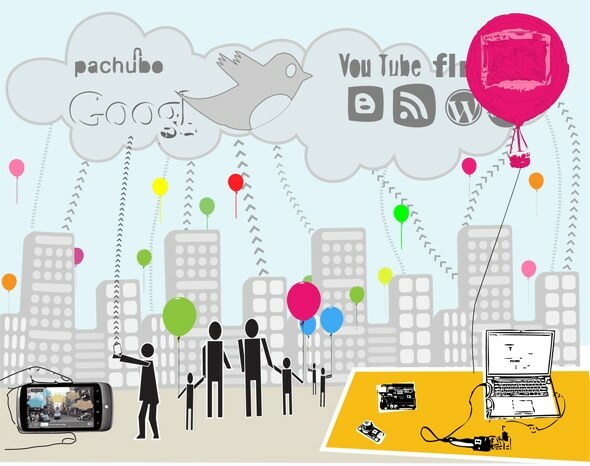 Next we will have a look at two examples of 2009 Participatory Sensing projects: Glob@s and MIMAQ. The first one is a project designed and developed at a medialab in Madrid, and the second one is a project supported by a dutch foundation. Globl@s is a project which was developed in less than a month’s time during the international workshop-seminar INTERACTIVOS’?09: Garage Science, that took place at Medialab-Prado in 2009. During this workshop Glob@s was collaboratively developed by volunteer participants both professional and amateur. Glob@s is aimed at children and has a strong educational focus. The project started by making a “do it yourself” mobile air monitoring device for children to explore their local environments and to raise awareness of pollution. The aim of Glob@s was to build an interface in a web platform that children could easily understand, and where the data visualizations displayed could show relationships between our behavior and the air quality levels. glob@s-the making of from susanna tesconi on Vimeo. Unfortunately this ambitious project appears as an uncompleted experiment outlined in a short time at those hacker space meetings. Anyway it brings to the table most of the questions and issues that are being worked nowadays in other air quality monitoring projects like the air quality egg. I invite you to have a look at the wiki project where more technical information is available. I would like to emphasize on its do it your self approach that makes possible the reproduction of the idea and the project anywhere and learn during the implementation process. MIMAQ is “Mobile Individual Measurements of Air Quality”. MIMAQ has been supported by Kennisland fondation as part of the Digitale Pioniersregeling. Kennisland is an independent organization from The Netherlands which doesn’t receive structural funding. Its mission “is to make our society smarter”, where people has “the ability to learn and to continue to innovate at a personal level “ by interacting with others and working together. In MIMAQ, the project data is collected by citizens at all times and places during their outdoor activities. A senspod mobile device (with environment sensors) carried by a citizens collects data and transferees it to a mobile phone via Blue-tooth. Every second, a sample of temperature, relative humidity, and noise level (dBA) is taken with a GPS location. A smartphone with Internet access allows data visualization in real time using using Layar Augmented Reality browser, where “NOx levels are rendered as clouds in the air”. There is also a google application which allows data to be stored and values can be visualized over time on google maps. MIMAQ’s pilot took place in Leiden, The Netherlands in 2010. Mobile sensing devices were carried by aproximately 60 volunteers during 9 months from April to October. Image retrieved from http://mimaq.org/resultaten/ NOx levels (red=hight) Red track corresponds with traffic congestion. Nearly all air quality measuring and monitoring projects had had the same limitations due to the use of low-cost components to build low-cost prototypes. In the case of MIMAQ, there were limitations related to the sensor calibration; the effects of the temperature, humidity and O3 on NOx levels; and the location accuracy (GPS). Regardless of limitations, it seems, according to what we can read on the Mimaq site that the pilot was quite successful. Even though MIMAQ pilot has been meaningful for citizens, participants haven’t defined the research objectives. Neither data can be considered open and nor citizens will decide on the future use of the collected data. MIMAQ could be classified between the “Public Contribution” and “Personal Use and Reflection” models exposed on the UCLA’s paper. Next post, we will explore other Participatory Sensing projects, how these projects are funded and what’s their current development process.